* Total number of reviews and star-ratings are based on data collected during the time period Boothe's Heating & Air has been using the ReviewBuzz system and may not directly match the data found on each public review site. Francis offered quick, professional and friendly service. Price quoted was price paid. Great job. Took out two old water heaters and installed a hybrid. Friendly, efficient and cleaned up after. Bernie is extremely knowledgeable. He took his time to thoroughly explain his findings and gave me multiple options to address his findings. At no time was he pushy or unwilling to answer my many questions and I had a lot. I would definitely recommend Bernie and the rest of the staff with Boothe's Heating, Air & Plumbing. I look forward to working with Bernie again in the near future. We had an absolutely fantastic experience! We scheduled our appointment on Friday and we were told we would be given a call on Monday an hour before the tech arrived. I received a call from a very friendly person at 9:30 asking if we were home and I was told the tech would be there shortly. Damon arrived at 10:00 and was very respectful, polite, and friendly. He and his trainee were very thorough, explained everything they did, and even offered to chat with my husband on the phone to explain in more detail as my husband is the more mechanical of the two of us. What was most impressive was, as they were outside checking our outside units, Damon came back inside asking if our neighbor was home because, as they were checking our unit, they noticed the neighbor's unit was very loud and frozen over. Upon calling my neighbor, she informed us that Boothe's had already been out and they were awaiting arrival of the part, but she was very grateful that he was observant enough to mention it! Excellent service - would highly recommend this company and we will certainly be utilizing their services in the future! 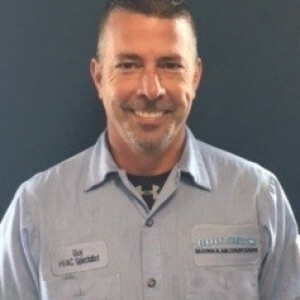 Francis arrived on time, worked efficiently, found and explained the source of an issue i have had for a while that is related to the HVAC system but is not obvious or typical. Our service tech, Francis Russell, was wonderful. He was very friendly and professional. He found the issue and got the job done quickly... and right! He explained the pricing up front, went over our options, gave us honest suggestions on what we should do. I would definitely recommend him to any friend or family member. Damon and David came to do a check up on my two units at my house and they were very friendly and courteous. Diagnosed some issues with one of my units and thoroughly explained the solution and fixed the problem. Damon is very knowledgeable and had David as his trainee. David has only been with Boothe's a short time but you can tell he really enjoys what he is doing. You know the company is good when an 18 year old is loving what he is doing. Solid work and would recommend Boothe's and Damon and David to work on heating and A/C. Garret is very professional, thoroughly explains the service being provided, and is extremely pleasant to work with. I will most definitely request him for my next tune-up or service! If customer service is important this company is tops! Initially met with Zach and went over all aspects of a new hvac system.Example: Cfm airflow improvements were made with the new system. The installers(Ronnie,Klye,Zach)showed up next and did excellent work including changing service entrance to evaporating coil to make future work easier. A week later Tom S. stopped in for a quality assurance check and performed a thorough recheck of the new system. 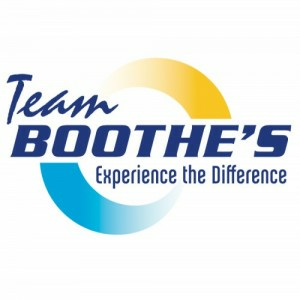 My phone calls to their main office always handled promptly:) I made the correct decision going with Boothe's!Thanks to the whole team. Josh arrived promptly and he provided a detailed explanation of the service he provided as well as explained the benefits of Boothe's Comfort club. 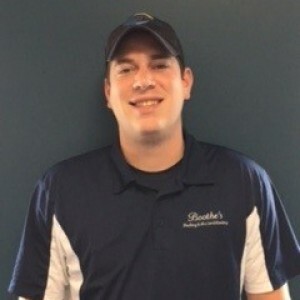 In addition, Josh exhibited exemplary customer service. I will be requesting Chadd W. for my plumber every single time. I had an inconsistent problem that I could barely explain and he worked through the issues to fix it. Unfortunately the first plumbers weren't able to correct the problem, but Chad was determined to get the problem resolved. Chadd W. will get the job done right while being considerate of your house. He put down drop clothes and towels to protect my house and minimize any possible mess. Thank you Chadd W. for the great work! Bernie was respectful, and took his time to ensure we understood everything he was doing, what was needed and why. Mike is awesome. Professional and skilled at his craft of plumbing. Very impressed and satisfied with the job he completed. His plumbing skills are works of art. He transformed our pump room into an art display of organized CPVC and plumbing fixtures, best its been in 50 years +.Thank you Mike,have a great anniversary with your wife ! Josh was great. he explained everything he was doing. He answered all my questions. 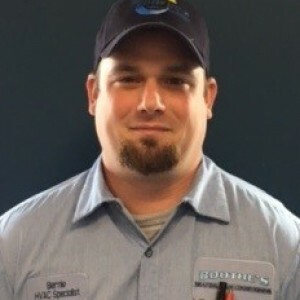 Chad has knowledge of techniques and devices that were beyond the ken of 2 master plumbers with whom I dealt prior to connecting with Boothe's. We are very grateful to him for solving our problems efficiently and at one third the cost quoted by others. We are so grateful to Francis Russell and Boothe's for helping us out with our AC. He was super friendly and truly seemed to have our best interest at heart, not trying to rack the bills on us. We will give Francis a call next time we are in need because he was awesome! Thank you! Bernie Hurt and Garret did an outstanding job installing my replacement AprilAire humidifier. I am a very inquisitive person. Bernie and Garret answered all my questions accurately and convincingly. I am a happy customer. Customer service is always a top priority at Boothe's Heating & Air. Our BBB Membership rating is like a badge of honor as we continuously strive to provide the best experience for our clients. Guy M has a 5-Star rating and leads the company in total reviews, making this pro a ReviewBuzz Rockstar! My hobbies include being on the water, recreation, hunting, and being with family and friends. My biggest strength is being able to fix problems in a timely manner. I have worked in this career for 25 years. I talked with Guy about issues I was having with heating and cooling my home and my monthly feedback from SMECO regarding the power usages from our home compared to others in my neighborhood. He suggested an upgrade to our Heat Pump and on the inspection prior to the new install, it was also found the original heating and cooling had an undersized return duct. Since the upgrade to an American Standard Heat Pump and an added return, our house has no issues heating and cooling. Our monthly energy reports have gone from 50% - 60% more usage than our neighbors to 18% more which is understandable because my wife is home everyday. Thank you Guy Mundie and Boothe HVAC. We have personally used Guy for all of our services for the last 7 years. Guy’s work is outstanding. 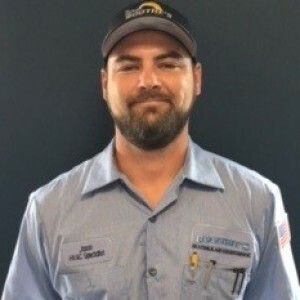 He goes above and beyond just a cleaning and servicing, he explains everything to you and let’s you know of any issues he foresees in the future so you can plan accordingly. When repairs are needed he explains all options, gives his personal recommendations but does not push you to make any one decision. Wayne has formed a great group of guy! Guy from Boothe's Heating & Air came to service our heating and air system. He was very professional and explained everything that needed to be completed. Guy prepared recommendations and prices. He did not push us in any way to have the work done. I would highly recommend Boothe's and Guy! Our system is working great! Very pleased with the service, Pin pointed the problem immediately and made the necessary repair to return cool air. Guy was thorough and explained everything. He suggested services without pressuring. Everyone I have talk to or met through routine maintenance calls have been a pleasure to work with. Today Guy came, He was very professional, knowledgeable, helpful, and very nice and personable. Thank you for tremendous service. I would most definitely recommend Booth's to my friends and family. Excellent service and information, as always. Guy M. was extremely courteous and professional and showed complete knowledge of my HVAC system. His high concern for customer service was 100 % evident. Your company should consider him a very big asset. Please pass on my thanks to him again for a job EXTREMELY WELL DONE!!! Knowledgeable expert, who is friendly and supportive. Good person! Very professional, reliable and excellent service especially during emergency situations. Highly recommended. Guy M. and Ronnie. were very friendly and polite. Guy put on new heater system. Ronnie fixed hot water which I didn't have for months. Thanks Guy M. and Ronnie. Because of the extreme cold, we knew how busy this company would be. In spite of that, they were able to work us in, and fix our furnace. Guy arrived well into the evening, and was thorough, and patient in explaining options to us, and was able to fix the problem. We were kept up to date by the office as to when he would arrive, and he called with an eta before getting to the house. Excellent caring and service. I requested Guy Mundie of Boothe's Heating and Air to service my furnace. He was very professional, knowledgeable and is an asset to the company. He is always on time, respectful, dresses and works in a neat and clean manor and does a thorough job. I highly recommend Guy and Boothe's Heating and Air. Boothe's service tech. Guy M.came to my house today to service my heating system and to install a air scrubber in my duct. He was very professional, very polite and very knowledgeable. Would definitely recommend this company above all others. I have been a customer of Boothe's Heating and Air for as many years as I can remember. I had an issue with my system this year and received service from Guy to repair the problem. Guy is a top notch professional at his job and I can tell he has been in this industry for a long time. He repaired the system in a timely manner and was professional and friendly throughout the visit. He made upgrade recommendations and even made suggestions on how to maintain the crawl space on the house to better maintain the HVAC system. Thanks for the great customer service. Guy was very friendly and informative during our most recent service. I would recommend Boothes to all of my friends for their needs. Guy was prompt, professional and a knowledgeable technician. He identified the problem, replaced the switch and conducted a thorough exam of both systems. I was glad we had the Comfort Service. Air was working within minutes of repair. I highly recommend Guy and Boothe's Heating & Air!